Quality Standards – Clark Kennedy Co. Inc.
Clark Kennedy Co. Inc. holds membership in CHEVMA, Canadian Manufacturers Association, The Toronto Board of Trade, Certified member of the Purchasing Association. Clark Kennedy Co. Inc. has quality programs in place to meet our customers’ and industry’s high standards. All material and fabrication is inspected prior to, during and after fabrication is complete. All identification is checked against original Mill test reports to ensure compliance. All shipments include test reports and appropriate letters of compliance as well as any exporting documents that are required. Clark Kennedy Co. Inc. holds a Certificate of Authorization from TSSA to design and manufacture fittings to CSA B51 standard and the ASME code. The appropriate products have Canadian Registration numbers and “U” Stamps. Manhole and handhole covers and rings are formed from materials listed in Section II of the A.S.M.E. Code. Material specification is stamped on each cover and ring. Every cover is certified for use at the pressure rating stamped on it. Seamless rings are fabricated from materials in accordance with A.S.M.E. Code specifications, and all welded rings are welded per Section IX of the A.S.M.E. Code. Reinforcement of openings must be calculated for each application on all rings. Rings are machined on one edge for a gasket surface. All depths of rings are nominal and are subject to a reduction not more than 3/16 of an inch after machining. Welded rings can be ordered with the weld x-rayed. Responsibility is limited to quality and workmanship of metal parts as proved by vessel fabricators hydrostatic shop test. Liability is limited to the replacement of or a credit for the defective part only. No contingent charges will be accepted. Gaskets are supplied as an accommodation only. No warranty on gasket service is implied or expressed. Where applicable, heads are manufactured in accordance with A.S.M.E. Code and heat numbers will be stamped or marked on each head. A copy of the original material test report will be supplied without charge. Partial data reports are furnished for two-pieced heads when applicable. Heads to be used on vessels for ammonia service can be stress relieved on request. Tolerances on all heads are within the A.S.M.E. 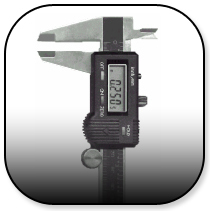 Code specifications; closer tolerances can be held when required for special applications.